I can’t think of anything more traditional (or delicious) than roasted Prime Rib with Mustard Cream Sauce for a special Christmas dinner. 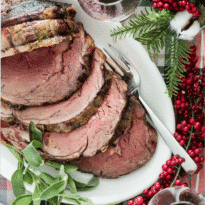 If you’re ready to celebrate the holidays in high style with a classic Prime Rib dinner, then this recipe is the one you want. Using sharp knife, cut slits in surface layer of fat, spaced 1 inch apart, in crosshatch pattern, being careful not to cut into meat. Rub 2 tablespoons Kosher salt over entire roast and into slits. Place meat back on bones (to save space in refrigerator), transfer to large plate, and refrigerate, uncovered, at least 24 hours and up to 96 hours. Adjust oven rack to middle position and heat oven to 200 degrees. Heat oil in large skillet over high heat until just smoking. Sear sides and top of roast (reserving bone) until browned, 6 to 8 minutes total (do not sear side where roast was cut from bone). Place meat back on ribs, so bones fit where they were cut, and let cool for 10 minutes. Tie meat to bones with 2 lengths of kitchen twine between ribs. Transfer roast, fat side up, to wire rack set in rimmed baking sheet and season with pepper. Roast until meat registers 110 degrees, 3 to 4 hours. Turn off oven, leave roast in oven, opening door as little as possible, until meat registers about 120 degrees (for rare) or about 125 degrees (for medium-rare) 30 minutes to 1 1/4 hours longer. Remove roast from oven (leave roast on baking sheet), tent loosely with aluminum foil, and let rest for at least 30 minutes or up to 1 1/4 hours. Adjust oven rack about 8 inches from broiler element and heat broiler. Remove foil from roast, form into 3-inch ball, and place under ribs to elevate fat cap. Broil until top of roast is well browned and crisp, 2 to 8 minutes. Transfer roast to carving board. Slice meat into 3/4-inch thick slices. Season with Kosher salt to taste, and serve. Whisk sour cream, heavy cream, yolks, mustard, vinegar, 1/4 teaspoon salt, and sugar together in small saucepan. Cook over medium heat, whisking constantly, until sauce thickens and coats back of spoon, 4 to 5 minutes. Immediately transfer to serving bowl, stir in chives, and season with salt and pepper to taste. Serve warm or at room temperature. First-cut beef rib roast is also known as prime rib, loin end, or small end. Look for a roast with an untrimmed fat cap. Ask your butcher for prime-grade, first-cut roast, my favorite choice for prime rib. It's worth the extra money, because it is consistently more tender and flavorful than choice-grade prime rib because of its higher level of marbling. Calories are based on a 7-pound (3-rib) roast. I'm assuming 10% of the weight is bones (this will vary depending on the roast) and that the yield after cooking is 80% (seems logical to me because it is a low-temperature cooking method). Your results may vary.